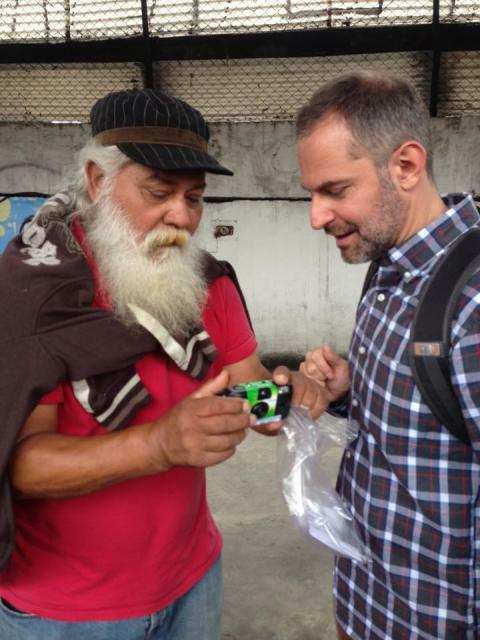 Cafe Art's photography project goes global: Brazil's homeless in "My São Paulo"
In early November 100 disposable cameras were given to homeless people in São Paulo, Brazil by London's Cafe Art social enterprise. The project was part of a joint initiative with Streetwise Opera's With One Voice project and Peoples Palace Projects Brazil. Run with the municipal government in São Paulo, the project will produce an exhibition and 2016 calendar, in the same format as the Cafe Art My London calendar which went viral in September. The 2016 Minha São Paulo calendar will be launched in São Paulo on Human Rights Day, 10 December. All the money earned from the project will go towards arts projects for people affected by homelessness in São Paulo. It will be sold by Cafe Art in the UK for £9.99 with all proceeds going to arts projects for homeless people in São Paulo. CAFÉ ART connects people affected by homelessness with the wider community through art. We hang artwork created in art groups run by homelessness sector organisations and hang it in independent cafes in London. We also run photography contests with disposable FujiFilm cameras. This year we ran the third My London contest, exhibition and calendar and the first My São Paulo calendar project in Brazil in November 2015.